Doggles dog goggles are designed to protect dogs' eyes from the sun's harmful rays, flying debris, wind, rocks, or bugs. 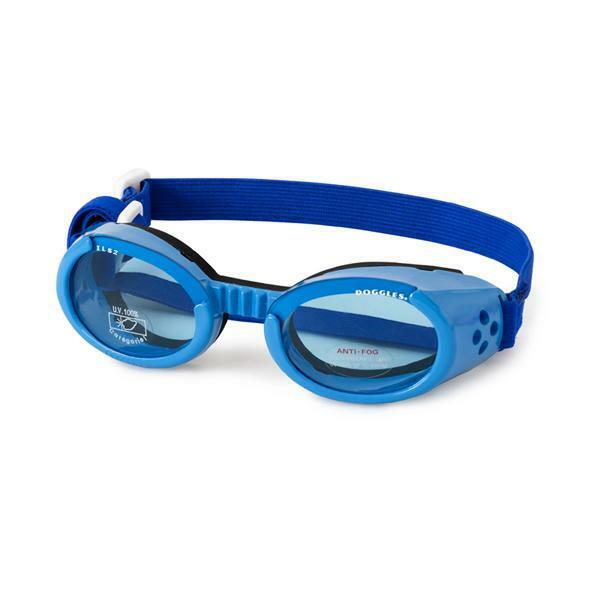 Your dog can't tell you his eyes hurt, so be proactive and protect your dog's eyes with these ILS Shiny Blue Frame with Blue Lens Doggles! Dogs need UV protection just as humans do, and if your dog is out and about with you, your dog should be wearing Doggles eyewear to protect its eyes from harmful UV rays! Doggles are designed just for dogs with a deeper lens cup (because dogs have protruding eyes), wide nose bridge (because dogs have really big noses), foam padding around the entire frame, and soft adjustable head and chin straps. Doggles also come recommended by Vet Ophthalmologists to protect their patients in all types of situations and also after some types of eye surgery. 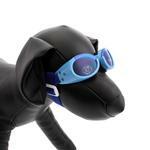 And don't forget that these Blue Frame and Blue Color Lens Doggles are in the height of dog fashion! I love BaxterBoo! When I'm shopping for my little pup they always have what I'm looking for. Every item I've purchased so far has been great quality and the discounts they have is a bonus! I'll keep using Baxter for my animal needs. Thanks BaxterBoo!